Just couldn’t resist sharing this picture, which was given to my maternal great-grandparents, Thomas and Mary Jane (Gaffney) McGinnis, by their oldest daughter, Benita. I love it so much that I have hung a copy as the centerpiece of a family photo gallery wall in our home. 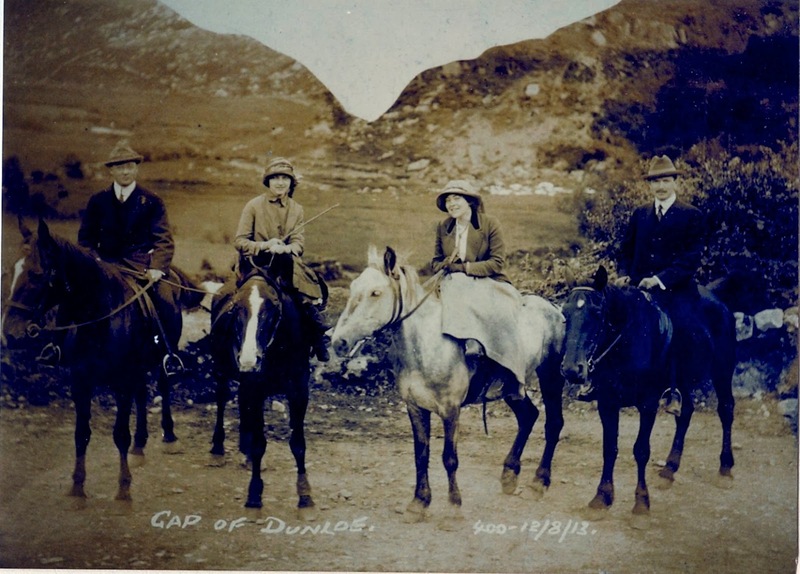 Benita is on the white horse, riding sidesaddle on the trail of the Gap of Dunloe, a narrow glacial mountain pass in Killarney, County Kerry, Ireland. Her companions are unidentified. The souvenir photograph, number 400, notes the day was August 8, 1913. Her excited expression speaks volumes about a young woman who has gotten traveling under her skin. She is clearly relishing this trip. We can almost feel her exuberance as she discovers yet another beautiful part of the Emerald Isle and resolves to make travel a way of life.